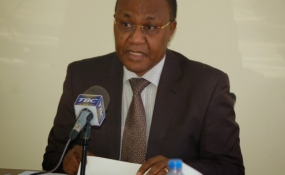 Dar es Salaam — The Minister for Lands, Housing and Human Settlements Development, Mr William Lukuvi, has demolished his three-room house, which is located at Mapogoro Village in Iringa Region, to allow for the expansion of the road. "It was my first house. I built it when I first became a member of parliament,' said Mr Lukuvi on Monday, October 16, shortly after arriving in Dar es Slaam from Iringa. "I was born in Mapogoro Village, Idodi Ward. I knew my house was supposed to be demolished since 1995 that's why I have decided to demolish it. Other people have already demolished theirs," said Mr Lukuvi who was once the Dar es Salaam Regional Commissioner. "I was able to salvage some of the most important items such as doors, windows and iron-sheets. I know what I am doing is a good thing because the road that is being constructed will help boost development in this area," he added. He said the house was until recently being used by the agricultural extension officer of Idodi ward. "He used to live in the house for free, but when road construction began, I told him to shift," he said.